If you've got a whopper of a spreadsheet, with thousands or more of rows, you've got a big problem if you want to make sure the spreadsheet doesn't contain duplicate entries. Excel simply doesn't have good tools for finding them. That's where Duplicate Remover for Excel ($30, 15-day free trial), an add-in from AbleBits, makes its name. Duplicate Remover for Excel goes through massive worksheets with tables up to 1 monster 1 million rows, and then finds and kills duplicate entries. Because it works right within Excel, as an add-in, you'll find it quite easy to use. In Excel 2003, XP, 2000, you run the program via the icon under the Ablebits.com menu item in the main Excel menu. In Excel 2007 and 2010, you run it via the icon on Ablebits.com tab. The program will find duplicates in a single worksheet, or between two worksheets. 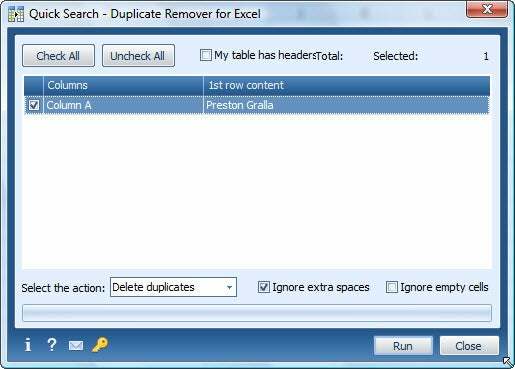 Duplicate Remover for Excel removes duplicate entries either automatically, or using a wizard. You have a choice of either using the Quick Remover or the Advanced Wizard. With the Quick Remover, you first select the range in your worksheet you want checked for duplicates--choose a range in just a single worksheet. Then run the Quick Remover. It looks through the range you've selected and deletes any duplicates it finds--you don't have to do anything else. If you want more control over the process, or want to remove duplicates in two worksheets, instead use the Advanced Wizard. It guides you through the step-by-step process of choosing ranges in one or two worksheets, including choosing options such as ignoring empty cells and whether the worksheets have headers. Then it finds the duplicates and deletes them. If you only rarely use large worksheets and need to kill duplicates, you might not find it worthwhile to pay $30 for this program. But if you do need to kill duplicates in large worksheets regularly, you'll find Duplicate Remover for Excel a big time saver.